Chickens, cows and pigs have been the only meat-giving animals in Minecraft for a long time now, and, in one of the most welcome changes included in the game's latest big patch, they are now joined by sheep. 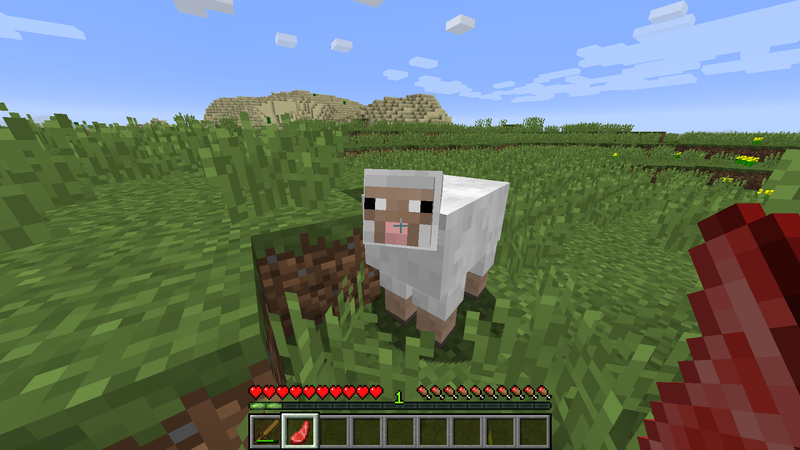 On October 25, 2009, sheep were added as passive, wool-giving mobs to the then-heavily-in-pre-alpha Minecraft. Shortly after, pigs appeared in the game, and later on, in the game's alpha, they were joined by two other passive mobs, cows and chickens—eventually, all three got their own meat drops. The sheep, however, remained meatless. So, with the now-official 1.8 "Bountiful Update," hunger management is that much easier thanks both to the addition of mutton, and the introduction of rabbits, which also drop meat (and probably make you feel more guilty when you cut them down). Of course, new meat types is far from the only thing added in the Bountiful Update which, clocking in at ten+ months, is the longest-developed update the game has seen so far. There are several new block types, two new enemy mobs: the underwater Guardian and the teleporting Endermite, a new dungeon called the Ocean Monument, and a lot of additional features for the game's scripting engine, which lets mapmakers do much more with an unmodded Minecraft—like last week's Simburbia, for example. It&apos;s SimCity in Minecraft. Literally. And, if you want to know more, the Minecraft Wiki has a long and detailed list of every change made by the 1.8 patch, including the various bugfixes, of which there's almost four hundred. This is one of Minecraft's biggest updates yet, so if you haven't looked at the game in a while, now might be a good time.